Ellen Goodnow, wife of Isaac Goodnow, wrote to her sister-in-law, Harriet, in New England. 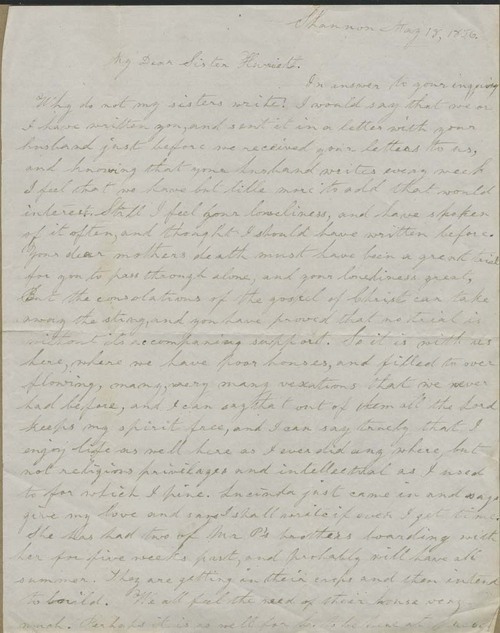 In this mostly personal letter, Goodnow reports on the joys and limitations of life in Kansas Territory, stating "I can say truly that I enjoy life as well here as I ever did anywhere." She did not anticipate trouble from border ruffians in their area, as her family's settlement was "too far from Missouri, too near Fort Riley", telling Harriet she would be "enraptured. . .in this country"; Ellen looked forward to a visit from her.